Hosting a board meeting or club meeting is more than just about putting the event on your calendar and booking the meeting room. It’s also about making sure you have all of the correct information printed up, coffee and snacks ordered, and your presentations done. 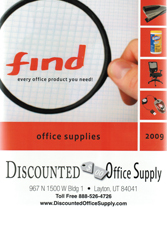 That’s where Discounted Office Supply.com comes in. We have a huge inventory of supplies and equipment to help you get your presentation done and looking great. We have great prices on a laminator machine, presentation boards, display easels, laminators and more. Every laminator machine or audio/visual supply we send comes directly from one of our 36 distribution centers across the United States. Browse by category below and order today. Copyright © 2019 Janisan, Inc. All Rights Reserved.